Empire of Books: Full title and cover for ZOM-B 3 revealed! 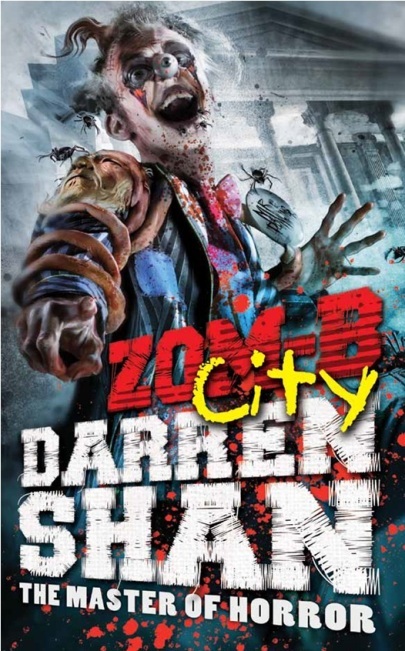 Just yesterday I reviewed the fantastic Zom-B by Darren Shan, and what a beauty of a book it is! The second in the planned series of 12, Zom-B Underground, is due January 2013, but today Mr. Shan has a special Halloween treat for us all! The announcement of the title and the revelation of yet another fantastic cover to add to his collection! It's called Zom-B City, and it actually comes out in March 2013, so not much of a gap between Underground and itself, all the better as that wait should hopefully go quite quickly! Anyway, now feast your eyes upon the cover!!! A zombie clown. With an eye for a nose. Incredible! Cannot wait to read it!